Lovely, delicate in appearance, and knits up quickly on size 10 needles. The blend of textures and colors in this cozy afghan make it a perfect fall project. Membership is required at this site, Bernat.com, to access the instructions, but it’s free and easy to join. They have lots of pretty patterns. Check it out…. 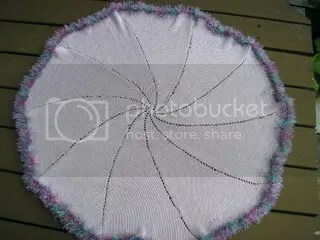 Judging from what I see around the web, the spiral crochet technique is becoming hot. Today, Crochet World newsletter posted a new pattern for a lapghan, and it certainly is eye catching. It requires using markers and moving them around, but otherwise looks straightforward enough. The pattern can be accessed right over here.